How Will a Trump Presidency Affect Solar Stocks? Solar stocks are taking it on the chin after the election, but that might not be investors' smartest reaction. Donald Trump is going to be president of the United States of America, and the solar industry is on its death bed. Right? The conventional wisdom coming out of the election is that First Solar (NASDAQ:FSLR), SunPower (NASDAQ:FSLR), Sunrun (NASDAQ:RUN), and SolarCity (NASDAQ:SCTY.DL) are all in trouble because solar policies are about to be turned on their head. But the conventional wisdom is often wrong, particularly when investing intersects with politics (more on that later). Here's why the solar industry is far from dead, and why it actually has a very bright future. In politics, solar energy is often billed as a source of energy that's very expensive and therefore needs subsidies to survive. But that's simply not true anymore. In Mexico, Argentina, and Chile, recent auctions for energy have led to the lowest solar prices we've ever seen, beating fossil fuels head to head -- and all without subsidies. In Mexico, the price for renewable energy sources recently came in at 3.3 cents per kWh at auction, and Chile saw prices of 2.9 cents per kWh without subsidies. By comparison, Lazard's most recent Levelized Cost of Energy Analysis says it would cost 6.5 to 15 cents per kWh to build a coal plant, 5.2 to 7.8 cents to build a natural gas combined cycle plant, and up to 21.8 cents per kWh to build a natural gas peaking plant. Solar energy is winning because -- along with wind -- it's the lowest-cost form of new energy generation in the world. Utilities buy energy on cost, and regulators won't allow them to buy more expensive energy from coal just because. If you've followed my solar coverage over the past six years, you may have noticed that I don't often talk about climate or the environmental benefits of solar because those factors don't make for a good investment thesis. But generating the lowest cost energy is a great investment thesis, and solar will beat coal any day when it comes to dollars and cents. It's easy to think that the president will have control over what forms of energy we use in the U.S., but the reality is that states are the real power brokers. They define net metering policies, renewable portfolio standards, community solar rules, and many other factors that drive energy decisions by consumers and utilities. If you think states like California are backing down from renewable energy because Trump is president, Governor Jerry Brown cleared that up just two days after the election. Where the federal government does have control in energy is with FERC, the regulatory agency that watches over interstate utility interactions. But it can't stop solar panels from being put on roofs or in fields or deserts within states. Then there's the concept of energy independence. If a Trump Administration really wants to reduce reliance on foreign energy, what better way to produce more energy than by using solar panels and using that energy to charge electric vehicles? Maybe that's wishful thinking. Donald Trump may not speak highly of solar energy, but the entire electorate is heavily in favor of solar. A poll by Gallup says that overall 79% of people think there should be more emphasis on solar energy (the highest of any energy source), and just 9% want less emphasis. By comparison, coal and nuclear power polled the worst, with 28% and 35% of respondents respectively wanting more emphasis on those forms of energy. Among Republicans, 70% want more focus on solar energy, and 63% want more wind. Solar energy is also a huge winner when it's on the ballot. As Florida was helping elect Donald Trump, it was also rejecting a ballot initiative from the state's utilities that could have killed rooftop solar before it got started. And 72.4% of Nevada voters punched their ballots for energy choice after NV Energy essentially killed the rooftop solar industry in the waning hours of 2015. People want solar, and they're willing to vote for it. The solar industry also employs about 209,000 people in the U.S., according to a report from The Solar Foundation. Most solar jobs are blue-collar, and the industry is growing at 12x the rate of the broader economy. To put the jobs picture into context, the solar industry now employs more people than coal mining and oil & gas extraction combined. If blue-collar job growth is the goal, solar will play a big roll in the future. Whenever an election takes place, there's conventional wisdom about what will happen next. And conventional wisdom is often wrong. Two things most analysts, investors, and even voters thought would happen when President Obama took office was the collapse of the banking industry and intense regulation that would kill U.S. oil and gas drilling. 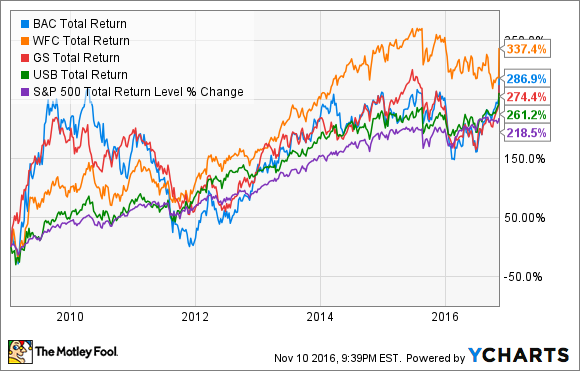 First I'll show a chart of the investment performance of Bank of America, Wells Fargo, Goldman Sachs, and US Bancorp, which all outperformed the S&P 500's total return since the day President Obama took office. Conventional wisdom on banking was wrong 8 years ago. 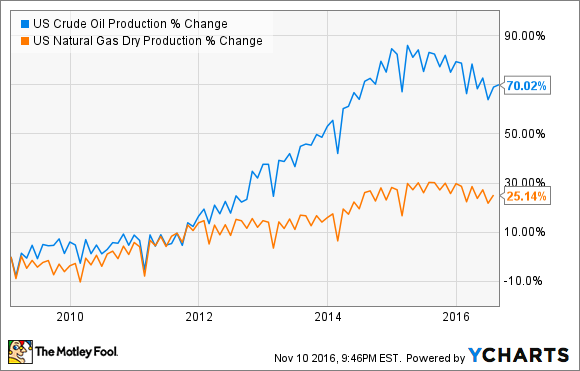 On the energy side, U.S. production surged under President Obama, as you can see below. Since his inauguration, oil production in the U.S. is up 70%, and natural gas production is up 25%. Production of oil rose just 4% during President Bush's term, and natural gas production dropped 12%. Who would have guessed that? Presidents don't control energy markets very much at all, and I don't think President Trump will be able to do much to kill the solar industry even if he wants to. The solar industry is too cost competitive and has too much voter and state support, and there are too many jobs at stake. The conventional wisdom is often wrong about how presidents will impact the market, and in this case I think the market is underestimates how well solar energy will do under a President Trump.